Unnamed woman, New York, NY, searching for her son, George Demonet, age 5, strayed from home last Monday morning. thankfully received by his mother, at the above house. 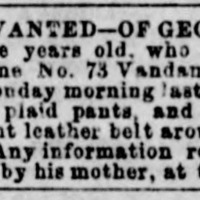 “Unnamed, searching for her son, George Demonet,” Information Wanted Ad, New York Herald (New York, NY), June 7, 1854, Last Seen: Finding Family After Slavery, accessed April 19, 2019, http://informationwanted.org/items/show/2045.